Copy the above Image or make your own and use it in your blog post. Write eleven questions for them to answer. Clear days or Rainy days? Hmmm... Clear days = Canoe + Dam... Or... Rainy days = Movie + Computer + Water filling up the Dam and tanks: Both. Both is good. Because it is easier then math. Would you like to live in Narnia/Middle Earth/Other or just stay in the Real world? Middle Earth if you please. What is your Favorite Chemistry Element? Do you actually know what this is all about? Hah. No idea. I thought it was everyone's evil plot to just get me to do a blog post. What is/has been your favorite Desktop Wallpaper. What? from what I hear, it is a very evil part of math so no. I do not like that Sam-I-am. Do you find thinking of Questions tricky? 1. What is your favourite blog you follow? Wha?... I can't pick favourites! I love 'em all. 2. Do you wear hats? 3. What have you read today? First Aid Manuel with questions that make no sense. 4. What is your favorite book of the bible? hmmm.. Not sure to be honest..
5. What craft do you like doing? Although I don't do it much (mainly because I need mum's help with 95% with whatever I'm making), I do like sewing. 6. What sort of blog posts do you like to read? hmm.. Funny, nice and inspiring. 7. What is a song you really like? No idea! I have Thousands. 8. Do you like hot things (like curry)? 9. What is your favorite subject for school? 10. How long (on average) does it take you to complete your school work? About 9:30 am to 3:30 pm - 4:00 pm... depends when I wake up really. 11. What is the worst and what is the best ‘first blog post’ you have ever read? I don't know.. I don't go Blog surfing often. AT LAST! I have completed two lots of eleven questions (22 total for those who have just finished their math and no longer want to do anymore for the day. ). Waitaminute... WHAT?! I have to write MORE questions? And nominate someone?! Dang it. Do you like using pens or pencils? What was/is your favourite book? What would you do if you had noisy neighbours and needed to sleep? Do you enjoy writing stories? Do you go to school, homeschool or have you finished school? 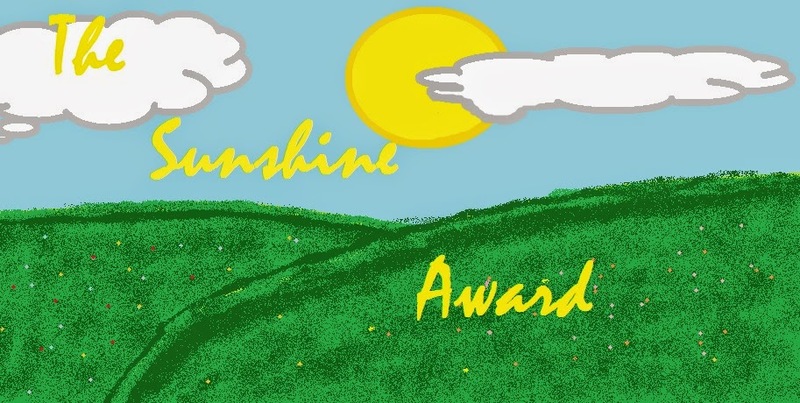 Why aren't the Sunshine Award questions a even number? Ha evil first aid manual and so painful questions but I have done them all now!!! YAY. So do your questions come with rules or are they just questions you want us to answer.... if we then have to nominate more people.... it could get really bad and someone might nominate you again and then you would have to nominate someone and then someone might nominate you and then you would have to nominate someone and then someone might nominate you.....yes well you get the point do you not. Fare Ye Well ..... I shall return.